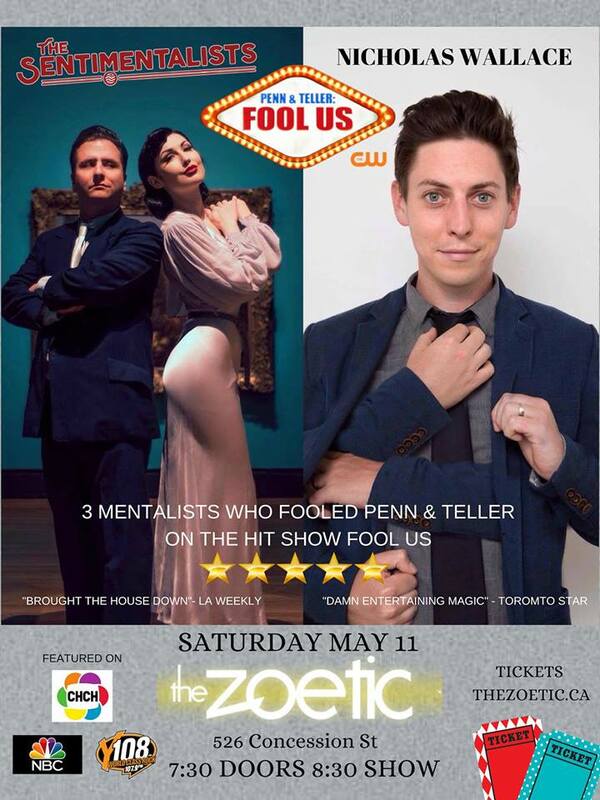 Two Season 5 winners of The hit show Penn and Tellers Fool Us combine to bring you one evening of mind blowing mental magic and mystery. Nicolas Wallace appears on stages across the continent and is an award winning magician and mentalist. Don’t be deceived by his innocent look, He has been described as "evil wrapped in Mister Rogers' sweater". Nicks magic has awarded him the prestigious Alan Slight award in prestidigitation as well as fooling Penn and Teller on CW network. The Sentimentalists are International stars of magic and a regular act at the world famous Magic Castle in Hollywood. Steffi Kay is the first woman mentalist to fool Penn and Teller on CW network. Together Mysterion and Steffi return to the Zoetic after repeated sold out shows across the USA. They promise to astound you with their special way of mental telepathy that is quickly earning them world fame. The Zoetic is Hamilton's premier vintage stage and a spectacular space to showcase a show like "The Foolers". Its Deco decor will bring you back in time to the vintage age of mentalism during this one of a kind show. This is an all ages event with themes of the supernatural and light mature subject matter. Discretion is advised.